Surveillance robots aims to provide information related to ground, air and marine surveillance such as border security, accidents, oil spills, land mapping, traffic, trespassing and others. Various unmanned robots such as drones, founded vast applications for monitoring and security purposes and being used by defense and civil sectors as well as used by individuals and companies for their personal surveillance benefits such as child care, security, and more. Various industry operators already automated the major operations in order to reduce the error and to increase the productivity. However, technology has its own cons but the minimization of complexity related to the core operations are the major factor which has transformed various verticals. These factors are giving rise to surveillance automation and encouraging the manufacturers to develop high end technology surveillance robots. Robotics and automation has changed the industries especially manufacturing, oil & gas, packaging and others. Global surveillance robots industry is transforming on the back of high-end technologies such as deep learning, artificial intelligence (AI), machine learning and others. In addition to this, Industrial Internet of Things (IIoT) will help the surveillance robots manufacturers to expand their footprints where the technology is being implementing to grow the businesses. On the other hand, U.S. Office of Naval Research granted USD 1.7 million in 2017 to Cornell Research University for the development of robot surveillance system for interpreting and sharing the information. Goldstein Research analyst forecast that the global surveillance robots market size is set to reach USD 10.23 billion by 2025, growing at a CAGR of 14.3% over the forecast period. Technological advancement in surveillance robots system, AI development, robots deployment in high risk areas, real time information requirement and government investments are some of the factors which are anticipated to boost the growth of global surveillance robots market over the next five to six years. 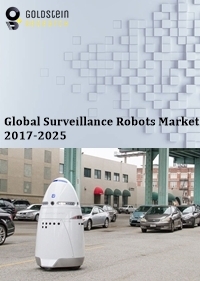 The report covers the present ground scenario and the future growth prospects of the global surveillance robots market for 2017-2025 along with the unit sales and global revenue of the surveillance robots. We calculated the market size and revenue share on the basis of revenue generated from major players across the globe. We have forecast the market on the basis of technology development and researches in surveillance robots, manufacturers and suppliers of surveillance robots, shipment of surveillance robots, investments in robotics industry. On the basis of surveillance type, unmanned aerial vehicle (UAV) accounted for the largest market share of 54.3% in 2017. Huge application of UAV in civil and defense sector, to achieve real time aerial view, impacted the growth of UAV segment. Defense sector is contributing the growth of global surveillance robots market at a CAGR of 10.3% over the forecast period, owing to increase in border and other security surveillance, mainly using drones for surveillance purpose. Global surveillance robots market outlook 2017-2025, has been prepared based on an in-depth market analysis from industry experts. The report covers the competitive landscape and current position of major players in the global surveillance robots market. The report also includes porter’s five force model, SWOT analysis, company profiling, business strategies of market players and their business models. Global surveillance robots market report also recognizes value chain analysis to understand the cost differentiation to provide competitive advantage to the existing and new entry players. One of the major trends of global surveillance robot market is technological advancement of these robots to miniaturize their size in order to avoid their easy detection so that they can provide better stealth surveillance abilities. Such advancements have significantly expanded their demand in defense sector for the application of monitoring and mapping of hilly areas. In 2017, US Air Force Office of Scientific Research teamed with a research team to develop micro aerial vehicle (MAV) that can carry out various military intelligence tasks. The use of AIS (Automatic Identification System), MWR (Microwave Radiometer), LiDAR (Light Detection and Radiation) has improved analyzing the data collected which is accurate, segregated and focused. Investments in robotics industry such as drones, is the driving factor for the growth of global surveillance robots market. Large companies such as Amazon have shown interest towards drones in package delivery and other shipping services and assured the widespread acceptance of drones in the near future. Further, the major challenge for surveillance robots manufacturers is the high cost of deployment of robots as compared to the man power along with the limited application of AI till date. Need has aroused for improved navigation systems, pattern recognition techniques and intelligent control methods for replacing humans with the surveillance robots that are human-centered. Based on geography, North America generated the largest market share of 34.2% in 2017 on account of the large number of applications of surveillance robots in various sectors such as in managing traffic, security handling, mines and other construction sites and more. In addition to this, Asia-Pacific is growing at a fast pace, at a CAGR of 10.8% over the forecast period on the back of rising demand for surveillance robots, attracting the establishment of global manufacturers within this region. Presence of global players is dependent on the government investment policies in various sector developments. Thus countries with high expenditure on defense sector are the opportunistic regions for the application of surveillance robots such as U.S.A., China, Russia, Israel, and more. Global surveillance robots market report comprises of the following companies as the key players in the surveillance robots market: Endeavour Robotics, Northrop Grumman, GE Aviation, SMP Robotics, EOS innovation, Aibotix, Guangzhou Walkera Technology, Frontline Robotics, AirRobot, Gecko Systems, Hoyarobot, Knightscope, MoviRobotics, Omnitech Robotics, Proytecsa. What is the revenue of global surveillance robots market in 2016-17 and what would be the expected demand over the forecasted period?